The silver volume that we saw last week was huge and we don’t mean only the one that accompanied the sizable daily price spike. The volume was huge also if we take the entire week into account. In fact, there was only a single week when silver rallied on volume that was bigger than what we saw during last week’s rally – ever. That was the 2011 silver top, when the emotions reached their zenith. But surely that was just a coincidence as there’s nothing else that connects these cases, some will claim, forgetting about the thing that is more important than price – time. The 2011 top formed on Monday, April 25th. You’re are reading this on Monday, April 23rd. Time is almost in perfect tune. Will this be a happy anniversary? It will, for those who are prepared. Let’s take a look at silver’s long-term chart for the details (charts courtesy of http://stockcharts.com). We marked the two biggest volumes that we saw during weekly upswings with red arrows. There were also two weeks when the volume during a rally was similarly big (but not as big) as the last week’s one. These were the weeks that preceded the 2011 top. In other words, the only situation that is similar to what we saw last week is the 2011 top and what we saw immediately beforehand. The implications are obviously very bearish for the following weeks. The less clear – but just as important – implication is that the decline that is likely to follow is probably going to be very sharp. This is what we’ve been expecting anyway based on several other techniques (i.a. 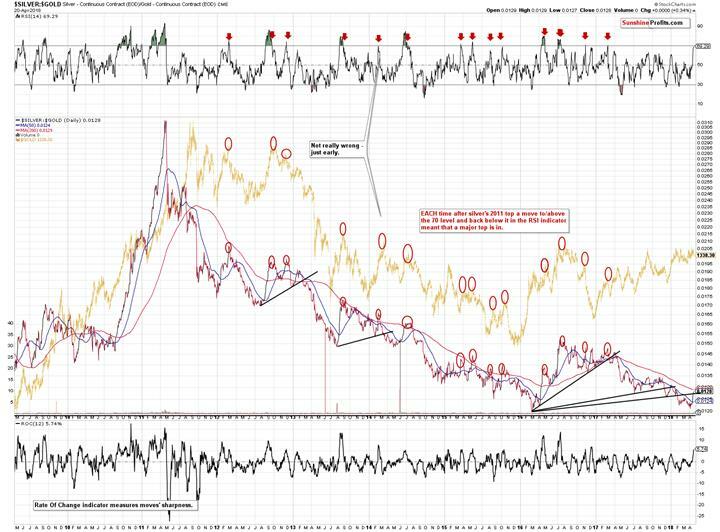 silver’s oscillating characteristic and the similarity to the 2012-2013 decline), so the odds for this kind of movement increased further. This well-confirmed expectation has important implications. If it wasn’t likely for the next big downswing to be volatile, it could make sense to focus on short-term price moves. But, since it is indeed the case that the decline is likely to be volatile, then it overall doesn’t seem worth it to engage in more short-term trading. It’s much better to lose a smaller fish and catch a much bigger one than the other way around. Of course, it’s not pleasant at the moment of losing the small fish, but it’s still the right and prudent thing to do. In 2011, silver did two major things on Mondays that we saw at this time of the year. It topped on April 25th in intraday terms and it started its huge decline on May 1st. So does this mean that silver will still rally for a week? This could be the case and let’s keep the above analogy in mind in case the white metal moves close to Wednesday’s intraday high. However, we wouldn’t bet the farm on this particular silver forecast. History doesn’t have to repeat itself to the letter, especially that the rally that preceded the 2011 top was much bigger than what we saw recently, and it took more time. Therefore, back in 2011 it seemed necessary for the market to take a few extra days to cool down the enthusiasm and this doesn’t have to apply this year. The decline could start shortly – and in a profound manner – without the few additional days of higher closing prices. The silver to gold ratio shows that the ratio moved back to the rising black resistance line which it broke earlier this year. That’s the third time that that we’ve seen something like that in the recent history. Each breakdown below the rising black line was followed by a correction back to this line. Then the ratio moved lower once again. That’s not the most important thing about the silver to gold ratio, though. The most important thing is that the RSI based on it moved very close to the 70 level and whenever the RSI gets above it and then declines, we see a major decline in the precious metals sector. To be clear, there are no certainties in any market, but please look at the areas marked on the above chart for details. Now, the RSI is only at 66.84, not above 70, but let’s keep in mind that there were cases when the RSI didn’t move to 70 and we saw tops in its proximity. For instance, the early 2013 top and the late 2015 top. This means that the precious metals sector could slide right away, but if silver outperforms just a bit more today (taking RSI above 70) and then declines in the following days, we’ll have a major and extremely effective confirmation that the final top is in. Silver has indeed outperformed once again yesterday, but the outperformance in terms of the daily closing prices wasn’t significant enough to push the RSI above 70. It moved to 67.98, though, so it’s much closer to the key 70 barrier. It seems close enough to say that if we saw a sizable downswing in silver and in the ratio here, it would serve as a very strong confirmation that the final top is indeed in from the medium-term perspective. Silver is declining so far today, so we could be seeing the start of the above. Silver did decline, but it was still strong relative to gold, thus pushing the ratio a bit higher. The same goes for the RSI indicator based on it, which moved to 69.29. It’s almost right at the critical 70 level. Combining this with the analogy to the 2011 top, we see a situation in which silver once again outperforms for a day or two and then slides erasing the entire previous week of gains, and then declines further. 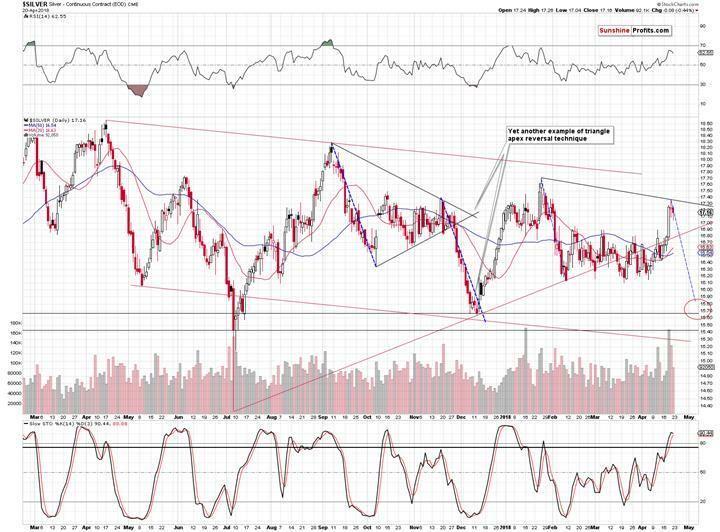 On a very short-term basis, we see that silver declined, but as we discussed earlier, it would not be impossible – or bullish – for silver to test the Wednesday’s high once again before plunging. Before moving to gold, let’s take a moment to consider what the likely effect of the upcoming price moves in silver will be on those who trusted silver’s outperformance directly and went long. Based on many years or working with investors and traders, we know this effect – people are likely to think and react to certain price moves. Naturally, there are always exceptions, but on average investors and traders often act similarly. Those who went long silver are likely very happy with their positions right now, feeling very confident and dismissing anything that could make their position seem incorrect. Some of them would even respond very emotionally (even to the extent of being aggressive) to the suggestions that they should short the market. They are also likely to dismiss the decline initially and then to argue that the outlook remains bullish. Once the position is under water, they will convince themselves that their trading position is actually a long-term investment because of silver’s positive fundamentals (forgetting that silver’s fundamentals will not stop a short-term slide, just like they didn’t in 2008) and this will go on until the losses are unbearable, which is when they will capitulate. For the entire time they will likely be blaming everyone else and silver price manipulation in general. Let’s keep in mind, however, that regardless of how you viewed the silver rally initially, it doesn’t have to work like in the above example – it’s not too late to get out of the market before the huge slide and re-enter at much lower price levels. Summing up, silver’s anniversary is approaching, and many signs point to a scenario in which its celebration will take a rather grim turn for those who believed in last week’s sharp rally. 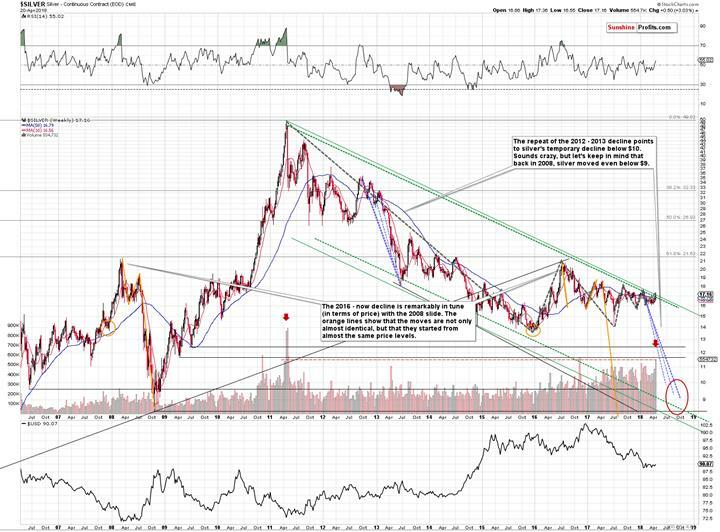 At the moment of writing these words, it’s still not too late to get out of the precious metals market for some time in order to buy back and much lower price levels, but it may soon be. The funny thing about investing is that what is often difficult to do emotionally is usually also profitable. It seems that this is the case once again. Your patience and persistence are likely to be well rewarded. Please note that the above is based on the data that was available when this essay was published, and we might change our views on the market in the following weeks. If you’d like to stay updated on our thoughts on the precious metals market please subscribe to our Gold & Silver Trading Alert.